Protect your landscaping from foot traffic using the Panacea Arch Folding Fence. Each section of this lovely barrier has a small arch as a focal point, with an additional arch beneath that for more interest and design. Two horizontal rods lend support to the unit, and their extended lengths connect the panels together with a hook and eye hinge. Such connections make placement simple, keeping the fence flexible enough to maneuver around curves or corners. The legs insert into the ground in moments, and the green, powder coated finish adds weather resistance. Line a walkway or path easily with this Arch Folding Fence. 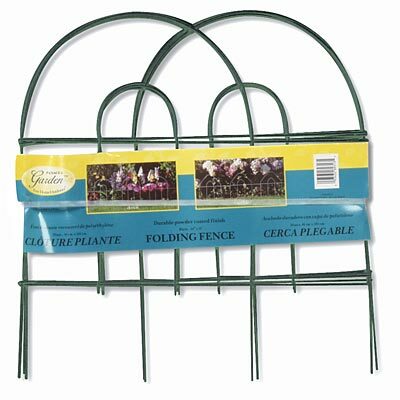 Note: This case pack includes 24 of the Panacea Arch Folding Fences.